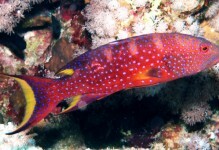 The Miniatus Grouper, also known as the Miniata Grouper, Coral or Blue-Spot Rockcod, Coral Hind, and Coral Grouper, is a common and popular fish along the coral reefs of the Indo-Pacific, and it makes a most spectacular addition to a large home aquarium. In the wild, it can attain sizes up to 18″, but tank specimens rarely exceed a foot in length. 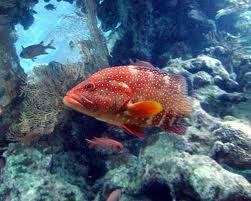 The Miniatus Grouper is a large and very hardy fish which requires a large aquarium of 180 gallons or more when full grown. 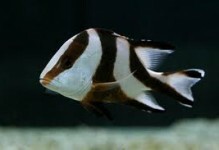 It can be compatible with other fish provided they are too large to be eaten. It should not be trusted around invertebrates or small fish. 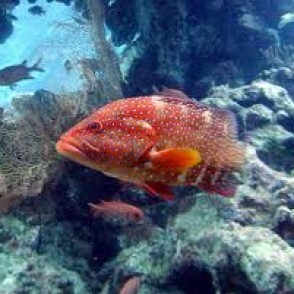 In the wild this reef predator commonly attacks schools of reef-dwelling fish. 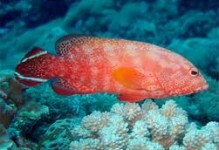 In the aquarium, freeze-dried krill soaked in Selcon, feeder goldfish, or squid are acceptable.